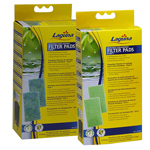 Genuine Laguna Mechanical/Biological Filter Pads are custom-sized to fit the Laguna SkimAway Skimmer Filter Fountain. Only the best quality material is used to ensure the best filtering results for your pond water. The densely-packed and intricately-woven material is extremely effective at filtering out particulate waste.